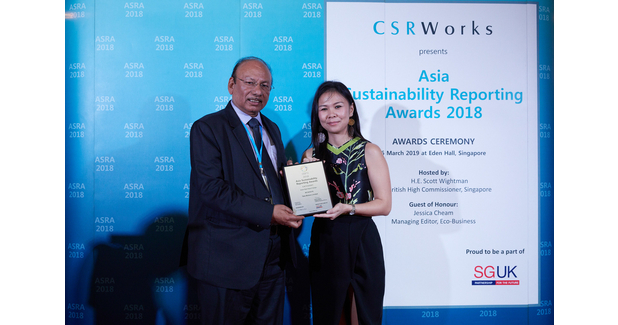 Tata Motors Ltd has won Asia’s Best Report Design at the 4th Asia Sustainability Reporting Awards (ASRA) concluded in Singapore. ASRA recognises and honours sustainability reporting leaders in Asia and is the highest recognition for corporate reporting in the region. Senior business leaders from 13 countries turned up at the exclusive awards ceremony hosted by the British High Commissioner in Singapore H.E Scott Wightman. The event was attended by dignitaries from diverse fields including academia, non-profit, embassies, trade associations and advocacy organisations. A record 82 companies from 14 countries made it to the final round of the 2018 Asia Sustainability Reporting Awards across 17 categories. The awards were presented by the Guest of Honour Jessica Cheam, Managing Editor of Eco-Business, the British High Commissioner, H.E Scott Wightman and special guests Dr Lawrence Loh, director of Corporate Governance, Institutions and Organisations at NUS Business School and Dr Wu Huijuan, Assistant Director, Singapore Institute of International Affairs. An independent judging panel decides the awards following rigorous criteria. The judges sifted through nearly 400 entries to select the winners. The judging process involved three rounds of screening and evaluations to identify the very best in each award category. Finally, comprehensive due diligence was carried out to assess finalists’ reputation among stakeholders, and the findings were considered to determine the winners.